Presented at the Second International Conference of Child Research Network Asia (CRNA) held in Tokyo, Japan, March 17-18, 2018. Indonesia has the world's fourth largest population, with approximately 34 million children aged between 0 and 6 years old. It is necessary to take into account this large number of children when formulating Early Childhood Development (ECD) policies. The government has implemented strategic initiatives by setting new goals, seeking ways to enhance the development of all children and maximize their potential. Indonesia has maintained an economic growth rate of more than 5 percent per annum for the past fifteen years. However, certain critical social issues have not been resolved, such as chronic malnutrition and poor hygiene, which have the effect of increasing maternal and infant mortality rates. Therefore, the nation has to face an ironic situation, achieving sustainable growth while struggling to reduce mortality rates. The government also faces a challenge to improve child-rearing conditions at home. In rural areas, which are home to 50 percent of the country's population, it is necessary to provide learning environments and materials and ensure a positive and warm child-rearing environment. In contrast, in the increasing number of urban areas, appropriate support for parents is needed along with the trend toward nuclear families and double-income households. In particular, families with expectant mothers and children aged between 0 and 2 are in need of public support. In response to such social issues, the Indonesian government has been seeking ways to provide more support for children. One such effort is to provide holistic and integrated ECD. This approach covers five domains; "health," "nutrition," "education," "nurturing," and "protection (from violence, abandonment, abuse, and exploitation)." It ensures the appropriate development of children according to their respective age under a systematic and integrated system through collaboration among government ministries and agencies. They mainly provide support for children aged 0-2 at home and at integrated health service posts, those aged 3-4 at playgroups (community-based early childhood services), and those aged 5-6 at kindergartens. These initiatives aim to provide support for children according to their respective age, to improve the quality of ECD services, to ensure cross-sector coordination, collaboration and partnerships, and to enhance relevant laws and regulations. These initiatives involve all government ministries, being a multi-faceted drive together with the private sector. Therefore, in addition to close coordination between each government ministry/agency, the government is advancing the establishment of legal foundations that enable initiatives from all related institutions. The government is also trying to enhance the capabilities of parents and teachers while focusing on the provision of equal and viable opportunities for ECD. As part of their efforts, the internalization and coordination of conventional religious and cultural values are being addressed. This is because Indonesia's cultural make-up comprises more than 600 ethnic groups and more than 1,000 local dialects and languages in use, with only one official language. In addition, there are numerous local communities addressing ECD programs. The government encourages the private sector to support these local communities and promotes active participation and collaboration among related institutions. In Indonesia, kindergartens were introduced in the colonial era. This was used as an elite education facility for privileged children and operated within a community in which only a limited number had access. Later, ECD guidelines were introduced, and in 2003, ECD systems have become integrated and more effectively emphasized under the Law on the National Education System. Nowadays, the importance of ECD has attracted a lot of attention, and more children can now receive ECD services. Nevertheless, there are still gaps in access to ECD, depending on children's social backgrounds. In 2007, 33% of children aged four from the wealthiest quintile families received ECD, while only 8% of children from poorest quintile families did so. Furthermore, 21% of children living in urban areas had access to ECD, while about 10% of children living in rural areas did. These large gaps existed in the actual setting of childhood education. Against such a backdrop, the government through its partnership with the World Bank launched a project to expand access to ECD services in rural areas in 2009 and implemented a cohort survey for four years. They established two project centers in 3,000 farming villages, and allocated two teachers, who had completed a 200-hour training course, to each center. These teachers were from these villages and required to reside in each community and work to increase the residents' awareness toward the importance of ECD. They also gathered volunteers from parents and community leaders and determined where to locate and who should lead the project centers. The cohort survey was designed to evaluate two cohorts of children; one cohort of children aged 1 years and the other cohort was children aged 4 years. At baseline, the survey results revealed that 60% of Indonesian children aged 1-4 years have never read books or had parents reading books to them, and 50% of families had no books at home. The survey also revealed that 50% of children would engage in cultural activities such as playing music, singing songs and dancing almost every day. Four years later, these two cohorts were assessed to measure the impact of the involvement of local communities in ECD. The assessment was conducted based on several indicators. 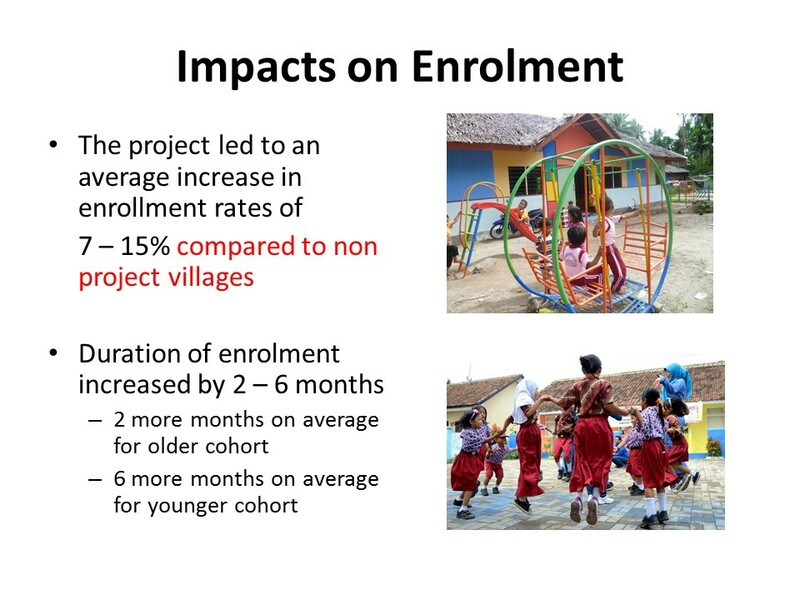 With respect to the impact of interventions, the enrollment rates in 3,000 rural villages increased by up to 15% while the duration of enrollment also extended longer than before (Figure 1). Qualitative assessments were also conducted. The Early Childhood Environment Rating Scale-Revised scores show that the rural villages in Indonesia had achieved relatively good results. This indicates that early childhood environments can be improved, even in rural areas, with the intervention of local communities. The survey also assessed effects on the development of children based on Early Development Instrument, Strength and Difficulties Questionnaire, and Dimensional Change Card Sort Task in each factor. For children started being surveyed at age 1, there had been major improvements in physical health and well-being and minor improvements in social competence, while good scores were achieved in language and communication skills. For the cohort of children started being surveyed at age 4, there were variations in emotional aspects, showing high scores among children from poor families and families with less parental involvement in education. This result indicates the importance of targeted support, community intervention, and child-rearing using "local genius *." There was no major gap as a whole between the group of children who had received ECD services and those who had not. In contrast, children from poor families showed substantial changes in social and emotional aspects before and after ECD services were given. When compared with children who had not received ECD services, these variations were more marked. The activities of the project centers continued for four years, and gaps among children from poor families were reduced. This indicates that it is important to participate in ECD as early as possible. Urbanization in Indonesia will proceed rapidly in coming years and it is projected that more and more poor families will migrate to urban areas. Therefore, it is necessary to address the treatment of poor families in urban areas as an important social issue based on such data. Next, I will explain the survey results in cognitive skills, targeting 6,000 children who received ECD services. There are significant differences in cognitive skills between children who had received ECD services and those who had not. This trend is more obvious when it comes to children of elementary school age. In Indonesia, there is also a question when children should start receiving ECD. For example, the group of pre-school children who started playgroups at the age of 3-4 years old was compared with the group of pre-school children who started playgroups at the age of 5-6 years old. The children started at the age of 3-4 years old showed better academic results at elementary school but below the average score. In contrast, those children who enrolled in kindergarten at the age of 5-6 years old and then enrolled in elementary school showed higher scores than the average score. Furthermore, those children who started playgroups at the age of 3-4 years old, enrolled in kindergarten at the age of 5-6 years old, and then enrolled in elementary school, showed the highest score. This result indicates that it is important to determine when and in what order children should start receiving ECD. In conclusion, ECD interventions have had significant effects on families in rural areas, in particular, on poor families with inadequate educational environments. Appropriate early childhood education at an early stage will positively affect children's well-being, language and cognitive skills. For children at higher ages, these interventions will enhance emotional maturity, social skills, and language/cognitive skills. Questioner 1: As you mentioned previously, the percentage of families with children who never read books is very high in Indonesia. How will the Indonesian government address this issue? A: One of the reasons why many families in rural areas have no books is that books are expensive. The government has started a book donation project whereby books and newspapers donated or posted at any post office on the 17th of every month, will be sent to the rural areas free of charge. Furthermore, the government issues subsidies worth one billion rupiah to every village and a small portion of the money can be used to purchase library books for residents. In some districts mobile libraries that go around every village are also provided to enable residents to get new books regularly, including story books for children, which is expected to improve their reading literacy in PISA (Programme for International Student Assessment). This is one of our challenges. Questioner 2: You said that about 1,000 languages are spoken in Indonesia, and there is only one official language. Does that make it difficult to provide books? Do they accept donations from overseas? A: People living in the more developed areas can speak the official language while speaking a dialect at home. However, there are certain areas such as in eastern Indonesia where children receive education in local languages in the lower grades. Local languages are important for residents to communicate and maintain their culture and confidence, but it is also important to consider the dissemination of the official language. If children are introduced to the official language at a later stage, this may reduce their motivation to learn. Therefore, it is necessary to teach children the official language at the earliest stage possible, at least by the time they enroll in elementary school. We welcome book donations from overseas, regardless of which language they are written in. We believe that books will always stimulate children's motivation to learn and have dreams for the future. Questioner 3: Would you consider the possibility of using digital books? I think there are many people using a mobile phone in rural areas, so the use of digital books is viable. A: The national library provides digital information, including e-books, accessible via personal computers or mobile phones. In Indonesia, there are more mobile phones in use than people. Since there are large numbers of people using a mobile phone in rural areas, we are planning to deliver information in a user-friendly manner and develop contents and information designs in the coming years. Questioner 4: I would like to ask about sustainability. At the beginning, this project received funds from the World Bank. In the future, how will you maintain the ECD centers in rural areas? How should local communities continue support for poor families? A: This is a very important question. After the financial support of the World Bank ended, we faced difficulties in maintaining the project centers in some rural areas. At the time when the project was designed, I requested as the director general of the Early Childhood Education Bureau to ensure sustainability as a prerequisite to approve the launch of the project. At the beginning of the project, we determined how to allocate the limited budget to the construction of the project centers in each rural area to meet the minimum standard for ECD centers. In the first two years, we paid compensation to two teachers of each center from our budget. After that, we applied various compensation methods such as payments in kind (e.g., rice) or cash depending on the prevailing conditions in each rural area. In this way, we encourage each local community to procure funds and maintain the project centers on their own after the project becomes fully operational in all rural areas. Questioner 5: It is important to support each child to achieve self-development, although there are regional and economic gaps that hinder the equal development of children. This problem is a critical social issue in Japan as well and will call for further debate. Currently, the Japanese government is earnestly working to make early childhood education free for all as well as to provide support for children from low-income families, including aids for private high school tuition fees. Questioner 6: As you mentioned, there are children who never read books in rural areas yet still receive cultural stimulation and acquire a high level of social skills. How would you maximize the effective application of this example to children at the ECD centers newly established in urban areas? How would you leverage this case to develop their social and emotional skills from cultural aspects? Also, please tell us what kind of support you will give to children with special needs or disabilities. A: In Indonesia, there is a traditional culture, i.e., "local genius," which should be protected and developed. We expect teachers to understand it and teach children at school. People tend to seek modernization and forget about "local genius." We teach such a situation to our students who will become a teacher in the future and convey to them various information relating to "local genius" as well as children's play and activities. We also encourage parents and local residents to practice "local genius." This is not easy because the community network is becoming more inactive due to the increasing number of dual-income households, etc. Therefore, further interventions are needed. We should utilize various vehicles such as child-rearing groups in each community to increase the practice of "local genius." With respect to support for children with special needs, we have introduced the "inclusive school" system starting from elementary school and allocate dedicated teachers to support such children. Nevertheless, there are still large gaps existing in the ECD field. To solve this problem, we are currently implementing a pilot project based on the example case in Singapore, "Mission I'm Possible." This program is designed to identify children's needs at the earliest stage possible and provide support for them through collaboration among teachers, psychologists, therapists, parents and communities to ensure their readiness to enroll in elementary school. Thank you very much for your questions and suggestions. 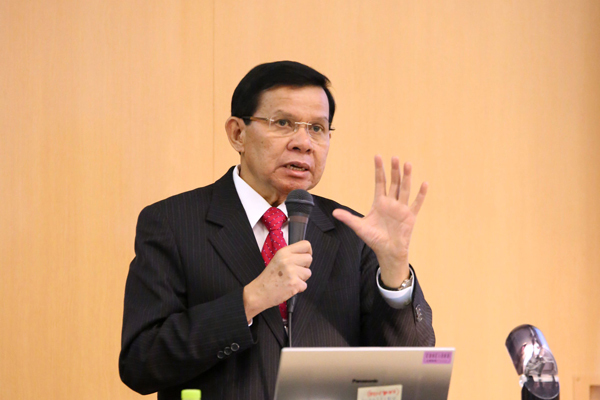 Prof. dr. Fasli Jalal, Ph.D, Sp.Gk., known as former Deputy Minister of National Education of the Republic of Indonesia, has held several important key positions in the government. 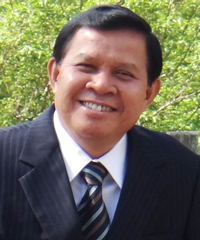 He was Professor of clinical nutrition at the Andalas University from 2009-2015, and is now active as a faculty member of Postgraduate Program of Early Childhood Education at Jakarta State University as well as doctoral doctor and examiner at the Faculty of Public Health, University of Indonesia. He also works as consultant in various NGO such as World Bank, WHO, UNICEF and Asian Development Bank.